Sorry! We have no remaining stock of any of the maps. This page is just for reference (and a reminder of the early internet, when there were no online maps). Just come to Japan and visit a 100-yen shop, where you can buy any of these items for 105 yen (after tax)! Or let Imaginatorium Shop deliver them to your letterbox, anywhere in the world! 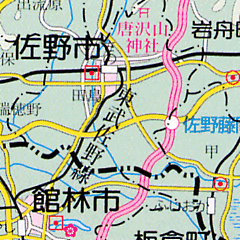 These are high quality maps, printed in full colour on tough paper, and based on source maps from the Japanese government Geographical Survey Institute. 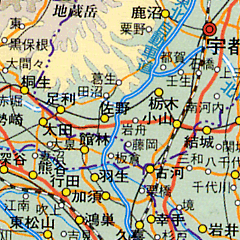 They are up-to-date editions (2001 or later), and show physical features, roads, railways, and ferry routes, but are entirely in Japanese*. 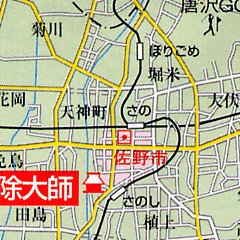 The region and prefecture maps also have a sepia version on the back, which you can use to draw on. 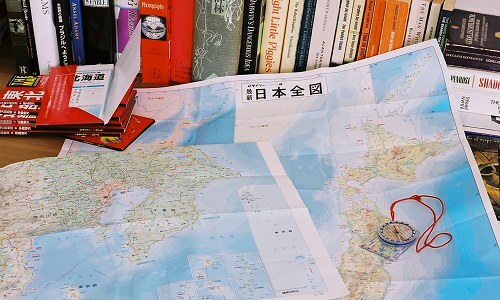 * Ah, but when I first arrived in Japan I bought a "Romanised" map, and discovered that part of the process of making things easier for foreigners involves "simplifying" the arrangement of roads - whereas you can assume these maps are accurate, and impress your friends at the same time! * What's wrong with Mercator? Read my article. This map may give you a new perspective, though, since it has the Pacific in the middle. The "key" link gives more details and a key for each map; you can print it out for use with the map. Why is it "THE MAP"? Well, for some reason, only capital letters really made it to Japan. And the English definite article enjoys an odd status here: no-one is very clear what it means, but it gets put in front of things that ought to be important. This particular 100-yen shop chain prefixes every single product line with the Japanese version - katakana za. And the photo on the right? 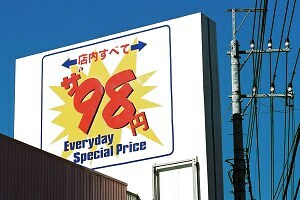 This is a competing chain, trying to undercut us with a price of "THE 98 yen". Yep, that little katakana represents the definite article. Sano location map - "Where is the Imaginatorium?" Maps and projections - my article on Mercator, Peters, et al.